After the Great Recession, the volume of Mexican immigration to the United States—and North Carolina—dropped sharply. Between 2009 and 2014, the Pew Hispanic Center found that more Mexican immigrants had returned to Mexico than immigrated to the U.S., with an estimated net migration of -140,000 individuals. During this same time period, Asian countries, such as China and India, emerged as leading senders of immigrants. Similar trends were documented in North Carolina. New data from the U.S. Census Bureau’s American Community Survey indicate changing patterns in North Carolina but not the nation. Nationally, India and China remain the leading sources of new immigrants to America. In 2015, the U.S. received 180,000 immigrants from India and 143,000 from China compared to 139,000 from Mexico. In North Carolina, immigration from Mexico more than doubled between 2014 and 2015, rising from just under 3,500 to nearly 7,400. The volume of Mexican immigration to the state in 2015 was greater than the combined volume of immigration from both China (3,500) and India (3,400). 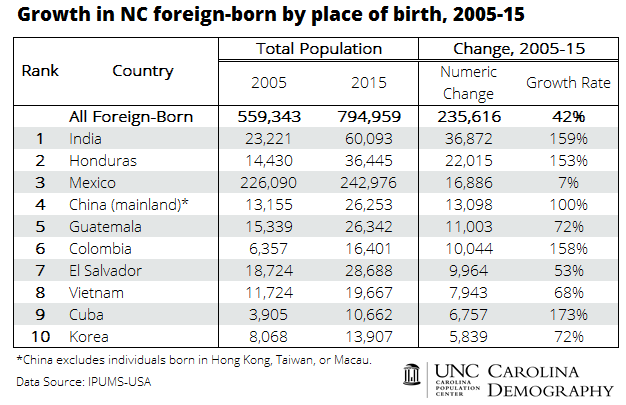 Although there have been large continued flows of Mexican immigrants into the state since 2005, North Carolina’s Mexican population has not grown as much as populations born in other countries. This suggests that the Mexican immigrant population sees more churn (in- and­ out-migration) than some other immigrant groups. The Mexican-born population increased by 17,000 individuals between 2005 and 2015, a smaller increase than the growth seen in the state’s Honduran (22,000) and Indian (37,000) populations. With nearly 243,000 individuals born in Mexico living in the state in 2015, Mexican immigrants remain the largest immigrant group in the state, but the Mexican population is growing more slowly than the overall foreign-born population. Between 2005 and 2015, the state’s immigrant population grew by 236,000 individuals or 42%, while immigrant populations from many countries grew at a far faster pace. As a result, Mexican immigrants are a declining share of the state’s increasingly diverse immigrant population. In 2005, Mexican immigrants accounted for 40% of the state’s foreign-born residents; this proportion had declined to 31% in 2015. “Foreign-born” or “immigrant” refers to individuals born in another country who were not citizens at birth, regardless of current citizenship status. The terms foreign-born and immigrant are used interchangeably in this post. Throughout, China refers to individuals born in mainland China and excludes individuals born in Hong Kong, Taiwan, or Macau. This entry was posted in Carolina Demographics, Migration and tagged American Community Survey, China, foreign born, immigration, India, Mexico. Bookmark the permalink.